서비스를 이용해주시는 회원님께 감사 드리며 개인정보 취급방침이 개정되어 변경 내용을 사전 고지 합니다. 개정된 개인정보 취급방침은 2019년 4월23일 부터 효력이 발생 합니다. 본 약관 개정과 관련하여 기타 궁금한 사항은 고객센터로 문의 해주시기 바랍니다. 'TRAX 'SNS MINI BUSKING with TRAX' Poster Artwork Event! e-mail address entered when subscribing to FanBook. participating in various future FanBook events. * Online: Using in methods such as reproduction, transmission, etc. * Offline: Using in methods such as reproduction, newsletter, exhibit, etc. * For other usage or additional businesses (including commercialization), it shall be determined after discussing with the applicant. all legal responsibilities shall be settled by the submitter and all awards shall be canceled and benefits shall be confiscated. 4) Inappropriate artworks may be deleted by the administrator without notice in advance. For other inquiries, please contact us at fanbook_staff@smtown.com. 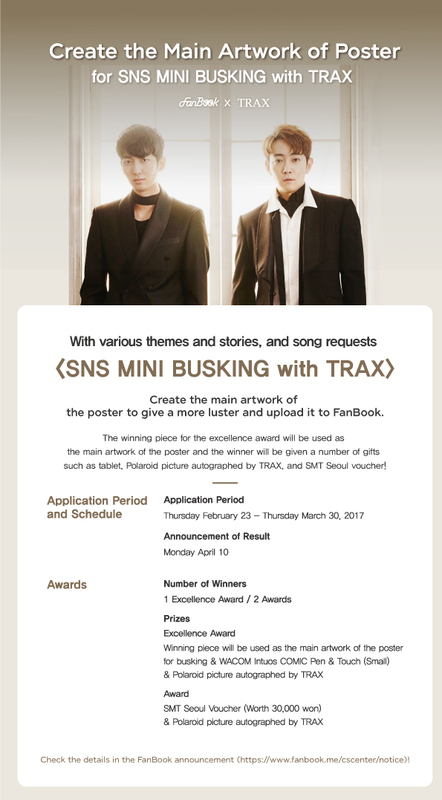 A contest for the main artwork of the poster for TRAX’s busking event <SNS MINI BUSKING with TRAX> has begun! stories, and song requests and upload it to FanBook. such as tablet, Polaroid picture autographed by TRAX, and SMT Seoul voucher! Any FanBook member can participate. 1) Create an artwork suitable for TRAX’s live busking and upload it to FanBook with hashtag, #TRAX_BUSKING. 3) The original artwork to be used in the poster should be folio poster sized (545 x 788(mm)) and the resolution should be 300dpi. 4) You can submit a limitless number of works. However, the winning work is limited to a single work for a single person. and all awards shall be canceled and benefits shall be confiscated. FanBook X Beaming Effect Charity Concert Poster Artwork Event Winners Announcement! Thank you for participating in FanBook’s ‘Draw a Fan Art for the Main Artwork for the Poster of the ‘Beaming Effect Charity Concert’ by Girls’ Generation’s SOOYOUNG!'. Please check the list below for the winning pieces. Winners will also be notified via the registered e-mail address entered when subscribing to FanBook. and kindly ask for your continued interest by continually participating in various future FanBook events. 1. All entries can be exposed within the scope specified in the terms and conditions for the use of FanBook. 2. Winners may be requested to submit the original piece. - Online: Using in methods such as reproduction, transmission, etc. - Offline: Using in methods such as reproduction, newsletter, exhibit, etc. - For other usage or additional businesses (including commercialization), it shall be determined after discussing with the applicant. 4. In the event that any adverse issue caused by any event which is related to the submitted artworks, all legal responsibilities shall be settled by the submitter and all awards shall be canceled and benefits shall be confiscated. 5. Inappropriate artworks may be deleted by the administrator without notice in advance. • In the event that personal information is not provided by Jan 1st, 2017(SUN), the selected winner may be canceled. • Personal information collected by us in order to deliver prizes will be destroyed within one month of the completion of delivery. • In the event that the winner cannot be contacted due to wrong contact information, the prize shall be returned and not be sent again. • The list of winning artworks are not arranged in the order of rank. Please send inquiries to fanbook_staff@smtown.com. FanBook is holding an event to select the main artwork for the poster of the ‘Beaming Effect Charity Concert’ with Girls’ Generation’s SOOYOUNG. SOOYOUNG held a charity bazaar called, ‘Beaming Effect’ this March and donated the profit to Korean Foundation Fighting Blindness, and this time she is holding the ‘Beaming Effect Charity Concert’ to raise funds through Kakao Story Funding in January 2017. We hope you participate in the year-end event prepared by FanBook x Beaming Effect and make a special and meaningful memory. The work of the winner will be used as the main artwork of the poster for ‘Beaming Effect Charity Concert’ with the logo designed by SOOYOUNG, and as a prize, the winner will be also invited to the concert and given a special chance to take a souvenir photo with SOOYOUNG! 1) Draw a <Fan Art of SOOYOUNG and Girls’ Generation implying warm sharing> to support the ‘Beaming Effect Charity Concert’ and upload it to FanBook with hashtag, #Beaming_effect. 2) Draw a fan Art out of the warm heart filled with the meanings such as “brightly open eyes” and “hope” to be used as the main artwork for the poster of the charity concert for promoting the blindness eradication campaign. 3) The size of the original fan Art to be used for poster production shall be a folio poster (545 x 788(mm)) / 300dpi in resolution. 4) You can submit a limitless number of works. However, the winning piece is limited to a single piece for a single person. 2) Award may be invalidated if it is impossible to contact the winner within 3 days after the award is announced. 4) In the event that any adverse issue caused by any event which is related to the submitted artworks, all legal responsibilities shall be settled by the submitter and all awards shall be canceled and benefits shall be confiscated. 5) Inappropriate artworks may be deleted by the administrator without notice in advance. We hope to see many of you participating in the event. We would like to thank everyone who visited FanBook’s first Fan Art exhibit [The 1st Exhibition, a project by FanBook]. Please be advised of the additional matters regarding the extension of the exhibit. you can see other Fan Arts registered in FanBook in addition to the works that have already been on display. Make sure to visit during the extended period to check the excellent and colorful Fan Art works from around the world. we have decided to extend the exhibition from November 14 (Monday) to December 31 (Saturday). The extension period of the exhibit is shown below. The first exhibition of FanBook, a fan art social platform where the fans all over the world can create and share various genres of fan arts! The exhibition is held to present the prize winning fan arts of the <’I Am a Creator’ Fan Art Contest> that was successfully held by many participants with the launch of FanBook last August. We will be able to see the excellent fan art works of the final winners in various areas such as illustration, webtoon, animation, and more at SMTOWN@Coexartium and SM Communication Center. Please be our honored guests and come meet the prize winning works. Thank you for participating in the Likes and Comments for the ‘I am a Creator Fan Art Contest’ by FanBook. Please check winners in the list below. Once again, we thank all those who participated in the contest and hope you have interest and take part in a variety of events of FanBook that will continue in the future. - Award may be invalidated if the personal information does not arrive by September 9, 2015. - If it is impossible to contact the winner or if the prize is returned due to the error in the personal information, the prize will not be resent.